You’ll need to be more specific if you’re asking for a Dr. Robert at Niagara Health. 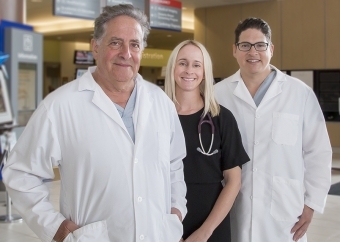 There are three of them providing care: Paul, an orthopedic surgeon with 35 years’ experience; his son Chris, also an orthopedic surgeon at the St. Catharines Site; and his daughter Jennifer, a hospitalist (a dedicated in-patient physician) at the Greater Niagara General Site in Niagara Falls. When they were growing up in St. Catharines, Chris and Jennifer didn't initially aspire to follow in their father’s footsteps and become physicians. Instead, they both had visions of teaching. And he’s equally proud of his other children who chose different career paths – the oldest, Gord, is a winemaker, and the youngest, Mike, is an accountant. Chris, 39, and Jennifer, 33, earned their medical degrees from Jagiellonian University in Krakow, Poland. Chris completed his orthopedic Residency at the University of Alabama at Birmingham and a Fellowship in joint replacement surgery at Western University in London, Ont. Jennifer completed her family medicine Residency at McMaster University’s School of Medicine Niagara campus. They both had opportunities to practise elsewhere, but chose to return home. “It’s a privilege to work in a city that you grew up in,” adds Chris. Paul, 67, was looking to slow down his career when Chris joined the Niagara Health surgical team five years ago. Paul no longer sees his own patients, but he works with Chris on joint replacement surgeries, providing guidance and wisdom. “I’m more of his assistant,” Paul says with a smile. Paul and his wife, Kathryn – who he says is the “heart and soul of our family and keeps us all together” – are happy to have their kids so close.